Background: Hospital admission can be scary for a child, most especially for hospitalized pediatric cancer patients, but studies show that there is growing evidence that environmental modification has a great impact in patient experience and health outcomes. Majority of pediatric cancer patients and their family was not satisfied with the unit environment. The aim of this study was to explore the impact of creating a child-friendly hospital environment in pediatric cancer patients and their families. Method: General surveys were conducted. Performance improvement team studied the result of the surveys, a specific survey was formulated. Relevant data were collected. After studying the results, suggestions for improvement were considered. Contributing factors for their dissatisfaction were also analyzed in a form of Cause-and-Effect Diagram. A post-intervention survey was conducted. Result: Result of general, specific survey and repeated focus group discussion showed that we need to create a child friendly hospital environment. Series of interventions applied like Wall posters designed to mimic a zoo, play rooms designated for certain age groups, quiet patient rooms for families to rest, an attractive waiting room and plasma televisions with kid channels. Post intervention satisfaction survey have shown an increase satisfaction rate of 90% from the pre-intervention satisfaction data which was 68%, with around 95% of hospital staff interviewed were very positive with the effects of the interventions to the patient’s journey of stay in the hospital. Conclusion: A hospital or healthcare setting needs essential tools to improve the quality of care continuously for their patient population to enhance comfort for the patient and the entire family. A small initiative to address the emotional needs of the patient can bring a huge difference in their health condition; thus, giving positive health outcome and an excellent journey of patient experience. Addressing the health needs of the patient has always been the main purpose of each health care organization around the world. Health is defined by World Health Organization as a “complete state of physical, mental and social wellbeing and not merely the absence of disease or infirmity” . In order to achieve optimum level of health, clients should feel comfortable whenever they are in health care institution seeking medical help. However, various researches stated that there had been numerous patient experiences which have been subjectively described as a frightening one whenever an individual has to undergo treatment in the health care setting. Several factors had been considered on why such hospital experience have brought apprehension on the part of the patients like the typical environment where nothing else can be seen except anxious patients, rushing health care providers and overwhelming hospital equipment. What more if a child has been exposed to such space like this environment? Children are vulnerable from these spaces triggering stress response leading to emotional trauma. Child, as defined by Oxford University Press, “is a young human being below the age of puberty or below the legal age of majority” . The researchers from University of Sheffield, England emphasized Hospital environments are commonly a place where children are afraid of because of needles, intravenous lines, blood procedures and closed spaces. This experience transformed hospital spaces into scary places. Hospital admission can be scary for a child, but the right environment can restore some normalcy during this time of healing. King Fahad Medical City-Comprehensive Cancer Center Pediatric Department comprises of 3 pediatric units: 2 inpatient units and 1 outpatient unit. Patients in these units are admitted with various hematological disorders and solid tumor malignancies for diagnostic work up, treatment including chemotherapy and management of complications. According to literature reviews there is a growing evidence base to support the view that environmental modification such as incorporating visual art into hospital spaces and having home-like setting where they can play their toys just inside the hospital has a great impact in both patient experience and health outcomes. A child-friendly healthcare is defined as the best possible health care provided by health workers who work together to minimize the fear, anxiety and suffering of children and their families. Another literature also tackled about hospital spaces stated “Children’s concerns around noise, size, cleanliness and tidiness match the worries of adult patients. This has not been acknowledged within policy. Health care providers have great roles in maintaining an environment conducive for patients. Socializing with staff was also important and nurses were especially valued for talking to in contrast to play workers. They were seen as organizers of activities and not to facilitate communication” . In our opinion, the appropriate agedbased environmental modification has a direct influence to children and family satisfaction of a child-friendly institution. This aim of the research is to study the impact of creating a child-friendly hospital environment on the level of satisfaction of the pediatric patients and their families of Comprehensive Cancer Center in King Fahad Medical City in Riyadh, Saudi Arabia. Patient experience is one of the core considerations to look into when it comes to providing quality of care in health care setting aiming the child-friendly institution. Advancing technologies now have paved the way to address the psychosocial needs of patients in children hospitals. The aim to initiate child-friendly environment is to help lessen, if not to alleviate, the suffering experienced by a child and to involve him or her during the course of care. In example, the child could be taught about the description of the procedure or treatment that he or she will have to undergo. This will be informed to him or her in a way that is suitable to the child’s level of knowledge and understanding. Educational materials that will be provided to the patient will include presentations or drawings that will help in making the child visually understand what is happening to him or her in a way that is not frightening. In this way, it will be much easier for the child to participate while the procedure or treatment is being done. The involvement of the family during child procedure is also essential. This is a way to let the patient know that the family will be with him or her along the way while procedures and treatments are being done. A literature supports this and states that “Children normally depend on family to meet all needs – both physically and emotionally. While their child is being treated at a hospital, parents often feel anxiety due to a loss of control in their role of caring for the child. The resulting stress within the parent often impacts the child” . In addressing this concern, we both help the patient and family become aware of how they can contribute to the success of the child’s treatment. When the parents know that they can also be in control of their child, they will know a best strategy on how they could make their child cooperate with the procedure as well; Thus, lessening the child’s fear about the whole hospital experience. Evidences show that when an environment is more attractive to the child, they become less anxious and scared of the hospital setting. “There is moreover increasing evidence that the display of visual art, especially in images of nature, can have positive effects on health outcomes, including shorter length of stay in hospital, increased pain tolerance and decreased anxiety” . It may be possibly considered as a temporary distraction strategy, but creating a child-friendly environment which is more conducive for the patient is a good way on how children hospitals can achieve desirable results on patient’s recovery process. Another literature emphasized that quality of the space was important for children. For long-stay patients or those who shared a multi-bed space, personalizing this space was important. They did this by bringing items from home such as toys, activities and photographs thus, they wanted more entertainment activities available that they could use without asking. These strategies help increase the quality of care provided to them and to their families. In addition to above citation, other researches and evidence based practices have also proven that patients who have been exposed to a hospital environment with incorporated visual art and naturethemed displays have shown lower levels of anxiety when undergoing series of chemotherapy regimen than those who were just exposed to a plain hospital environment [6,7]. Environmental modification has a positive impact on health care providers because it helps reduce their stress brought about by the workplace, and at the same time, helps in improving their delivery of care to patients and the families; thereby, helps in improving health outcomes . In addition, several specific modifications have also been proven as evidence-based such as construction of Patient rooms and environmental wall designs to promote a relaxing environment. The ambience of a hospital or any health care setting can contribute a lot in promoting a healing environment for the patient . Systematic process was followed in order to implement the child friendly environment initiatives in pediatric cancer units (Figure 1). Series of surveys in 2011-2014 were conducted and the response from pediatric hematology and oncology department was 60%. Based on previous general surveys, patient and families were observed to be not satisfied with the unit environment. Subsequently, we planned to initiate specific questionnaire related to the child-friendly environment in the pediatric units. In addition to this, a performance improvement team was organized to set the specific plan and objectives. Questionnaires were prepared in the language which is understandable by study population. Pilot studies were done prior to each survey in each stage to validate the questionnaire which includes two different parts: the first one, asking about the demographic data of the participants, while the second part elicited information regarding their level of satisfaction on the hospital’s present environment, and their expectations. After that a patient questionnaires was finalized and floated among the participants of this study as pre-intervention survey. The respondents of this study included pediatric hematology and oncology patients and their families in Comprehensive Cancer Center, King Fahad Medical City. Relevant data related to the patients and family hospital environment experience and expectations were collected and corresponding responses randomly from patients and their parents. The contributing factors of the dissatisfaction of patients and families regarding the hospital environment were studied by the performance improvement team which composes of the multidisciplinary members who studied about the probable reasons of the respondents’ feedback. Causes of the dissatisfaction were analysed and formulated in a form of a Cause and Effect Diagram  (Figure 2). Literatures have also been reviewed by them in order to analyse several evidence-based initiatives to create a child-friendly hospital environment. Figure 2: Cause and Effect Diagram. Consequently, improvement strategies were formulated and implemented to improve the patient environment. Thus, a post-intervention survey was conducted to evaluate the impact of the initiatives. Respect for the dignity of research participants have been prioritized during the entire process of research. Confidentiality of information was assured and the participation remained voluntary. Similarly, independent cancer center pediatric patients or parents/legal guardians of pediatric patients have completed the questionnaires regarding hospital environment and dropped it in to the box provided. The study was reviewed by the IRB of KFMC and there are no apparent risks to participants observed in this study. Pre and post intervention survey was conducted and it was broken down into several sections. The first section asked the respondents about the age of the patient, their gender and several questions relevant to their level of satisfaction regarding the available child-friendly hospital facilities in the pediatric unit (Table 1). Table 1: The table above showed there is no significant difference in the age and gender in pre and post intervention study population. The respondents were asked to rate the general appearance of the Pediatric Department pre and post-intervention of the strategies. As shown in the graph below, the total level of satisfaction of the respondents increased from 77% to 93% (Graph 1). The part of the survey asked about the satisfaction level of the respondents about the environment and recreation in the Pediatric Department. It has been noted that the level of satisfaction significantly increased from 59% to 91% as presented in the graph below (Graph 2). The third question asked the respondents about their satisfaction level with regards to the décor and furniture available in the unit. The data presented below shows that the satisfaction level has improved from 71% to 90% after the implementation of the child-friendly strategies initiated by the performance improvement team (Graph 3). 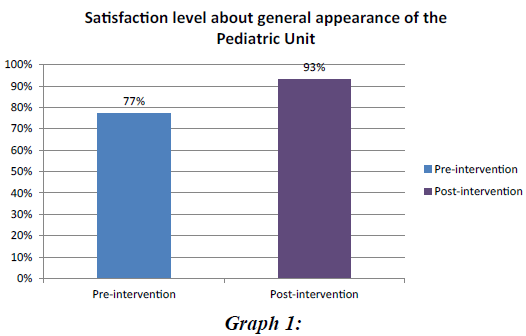 The graph shown below compares the satisfaction level of the respondents regarding the availability of games in the Pediatric Department before and after the intervention. In sum, the level of satisfaction spiked from 62% to 88% which shows an improvement to this category (Graph 4). The respondents were also asked to rate their level of satisfaction about the availability of the graphics suitable for children. As shown in the graph below, the total level of satisfaction of the respondents have changed from a percentage rate of 69% to 94% (Graph 5). A part of the survey also asked about the satisfaction level of the respondents about the availability of television channels suitable for children. It has been noted that the level of satisfaction increased from 70% to 87% as presented in the graph below (Graph 6). The last question in the survey floated among the respondents talked about their level of satisfaction with regard to the waiting area available in the Pediatric area. The graph presented below shows that there was an increase in the level of their satisfaction from 70% to 88% after repainting and renovation has been done to the waiting rooms (Graph 7). One of the goals of Comprehensive Cancer Center (CCC) of King Fahad Medical City is to ensure hospitalized children shall have opportunity for play, recreation and education suited to their age and condition and shall be in an environment designed, furnished, staffed and equipped to meet their needs. A patient satisfaction survey conducted gave a result of 68%, where most of the patient and family displayed their dissatisfaction about the unit environment. Issues have been raised regarding patient’s boredom and frightfulness during their hospital stay and conduct of treatment and procedures. Cause and effect analysis has been done as discussed in the methodology. After the series of analysis has been finalized, a set of interventions have been done and applied. The patients and the family have been asked to be involved in developing ideas for the unit environment. A budget plan was prepared and approved. Drastic improvements have been initiated. Environmental construction and educational sessions were the major components of the intervention. Several meetings were conducted by the performance improvement team to brainstorm ideas for the design in the pediatric area until such time that the group has chosen and agreed to make use of nature and zoo as a theme for the environmental construction. An artist from outside was contracted for the installation of appropriate designs (Figures 3-9). 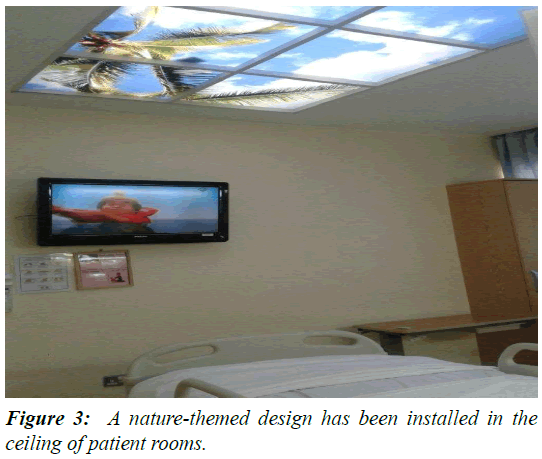 Figure 3: A nature-themed design has been installed in the ceiling of patient rooms. 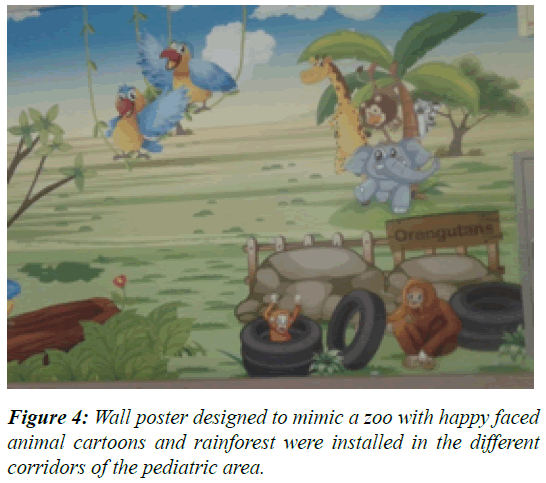 Figure 4: Wall poster designed to mimic a zoo with happy faced animal cartoons and rainforest were installed in the different corridors of the pediatric area. Figure 5: The school room/play room has been redesigned to include decorations, video games, storybooks, writing and art materials. Patient rooms with recliners for families to rest were implemented. 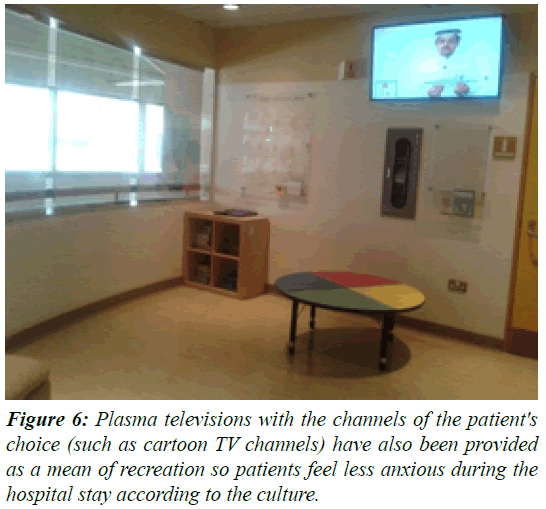 Figure 6: Plasma televisions with the channels of the patient's choice (such as cartoon TV channels) have also been provided as a mean of recreation so patients feel less anxious during the hospital stay according to the culture. Figure 7: Toys have been provided for the patients as a form of positive distraction technique during conduct of procedures. 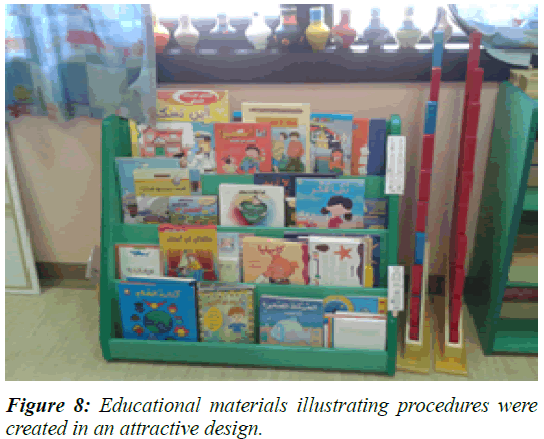 Figure 8: Educational materials illustrating procedures were created in an attractive design. Figure 9: Lastly, the waiting areas have been rearranged with comfortable chairs, wall paintings, internet access and plasma TV. The whole pediatric area of Comprehensive Cancer Center was able to set out an environment which was less frightening on the part of the child patient. In addition to all these interventions, education sessions in a 9-hour workshop and other series of in-service programs (one hour) have been conducted to the nursing staff about managing time effectively so that they can attend emotional needs of their patient better. Other healthcare professionals were involved and the initiative was discussed in different activities. 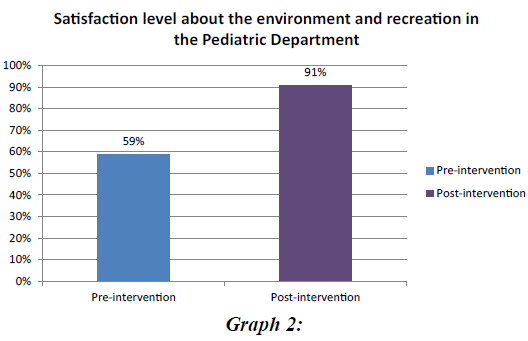 After the series of interventions applied, a patient satisfaction survey conducted have shown an increase in patient satisfaction 90% from the pre-intervention satisfaction data which was 68% about unit environment and recreation facilities, with around 95% of hospital staff that were interviewed responding positively about the changes in pediatric setting. In addition, there had been several compliments from the family about their appreciation on how staff nurses deal accommodatingly with their children during their stay in the hospital. With all of the positive changes that the study has brought about, Comprehensive Cancer Center continuously aims to improve the quality of care for pediatric patients and to enhance comfort for the entire family. In general, the hospital setting may possibly give a frightening impression on the part of the child and his or her parents although we didn’t measure the emotional level regarding the effect of the hospital setting. But even a small initiative to address the emotional needs of the patient can bring a huge difference in their health condition; Thus, giving a positive health outcome and an excellent journey of patient experience. Any hospital or healthcare setting essentially aims to improve the quality of care continuously for their patient population to enhance comfort for the patient and the entire family. The post intervention patient satisfaction survey result shows a significant increase in the patient and family satisfaction about the unit environment. Thus, confirming the fact that improving hospital environment can have great impact on the patient outcome. The appreciation received by such a hospital from patients and its staff was evident of the need of attention the environment of a hospital requires. The study also shows that, the support from the staff and hospital administration has a very important role in creating more supportive and healing environment for the pediatric patients in a hospital. The researchers would like to thank King Fahad Medical City for supporting the project, as well as the performance improvement team and Pediatric Hematology and Oncology Department for facilitating the surveys and implementation the strategies for the improvement of pediatric units, for their assistance and for their unending support for the completion of this study. Lastly, the researchers would like to acknowledge the Infection Control department, and Executive Administration of Operations for the support activities conducted related to the research. Curtis P, James A, Birch J. Space to care: children’s perceptions of spatial aspects of hospitals. Swindon: ESRC End of Award Report. 2007. Addressing Psychosocial Healthcare for Children and Families. 2014. Lankston L, Cusack P, Fremantle C, et al. Visual art in hospitals: case studies and review of the evidence. Journal of the Royal Society of Medicine. 2010: 103: 490-499‏. Southall DP, Burr S, Smith RD, et al. The Child-Friendly Healthcare Initiative (CFHI): Healthcare provision in accordance with the UN Convention on the Rights of the Child. Pediatrics. 2000: 106: 1054-1064. Tse MM, Ng JK, Chung JW, et al. The effect of visual stimuli on pain threshold and tolerance. Journal of clinical nursing. 2002; 11: 462-469. Zimring C, Joseph A, Choudhary R. The role of the physical environment in the hospital of the 21st century: A once-in-a-lifetime opportunity. Concord, CA: The Center for Health Design. 2004. Schweitzer M, Gilpin L, Frampton S. Healing spaces: elements of environmental design that make an impact on health. Journal of Alternative & Complementary Medicine. 2004;10:S-71. Koripadu M, Subbaiah KV. Problem Solving Management Using Six Sigma Tools & Techniques. International Journal of Scientific and Technology Research. 2014; 3:91-93.